A Prime Time investigation into allegations that homes were built with defective blocks across Co Donegal including Inishowen will air tomorrow night (May 31) after the main evening news on RTE1 at 9.35pm. The Prime Time team has been working closely with the Mica Action Group (MAG) for several months. They have travelled to the county to meet MAG members, a number of affected homeowners and key stakeholders on this issue. MAG today said it has "worked hard" to ensure a full picture of the "serious and desperate" situation facing homeowners, will emerge. The group are hosting a public viewing of the Prime Time programme at An Grianan Hotel, Burt, tomorrow, Tuesday, at 9.35pm and are urging anyone affected or those with an interest in the the issue to go along. 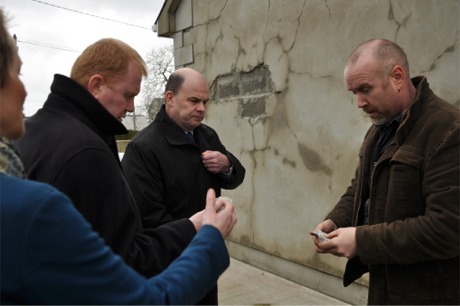 Pictured from left, Ann Owens (MAG); Minister Paudie Coffey and Damien McKay, structural engineer, visit affected homeowner Oliver Lafferty last year as he demonstrates the crumbling nature of the blocks used in the construction of his home. Mica Action Group joint secretary Eileen Doherty said: “To give this issue national media attention is long overdue and we hope that viewers will see the desperate situation homeowners are finding themselves in, through absolutely no fault of their own”. MICA is urging affected homeowners to register via its Facebook page. The group recently met the independent panel set up to look into the problem and continues to lobby the Government for a redress scheme to compensate homeowners.